In 2015, the Special Missions division of the general aviation unit for a U.S.-based industrial conglomerate was faced with a highly sensitive project. The mission involved the safe return of six single-engine aircraft from the war-torn country of Afghanistan to Wichita, Kansas via charter. AIT Worldwide Logistics has a long-standing partnership with another aerospace division owned by the parent company. This strong relationship afforded AIT the opportunity to assemble a defined service package and execute the operation. Multiple challenges conspired to add complexity to the project with a high risk for skyrocketing costs. 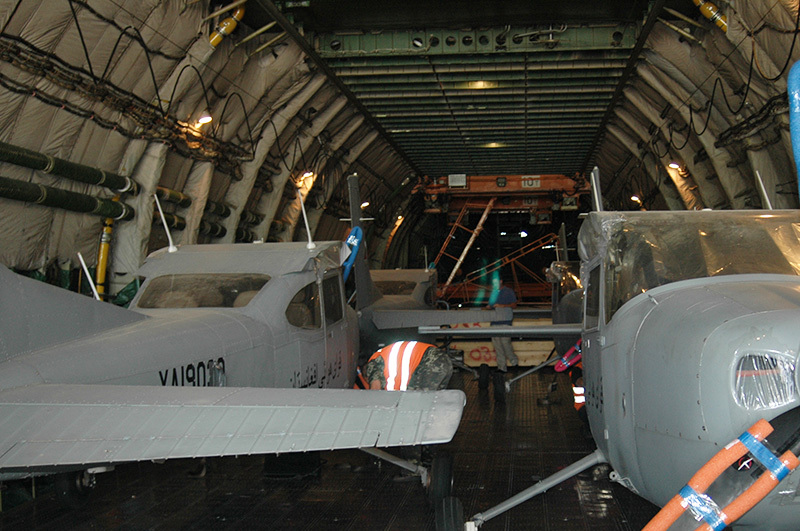 The customer wanted to avoid dismantling the aircraft for shipping, which left very few equipment options. Flying out of Afghanistan is inherently dangerous as is navigating the airspace in the region. Minimizing flyover permit fees and royalties would prove to be tricky at best. Trust, above all, was the primary motivator for this customer. AIT’s proven history delivering logistics solutions for one of the customer’s aerospace divisions established an initial level of trust. 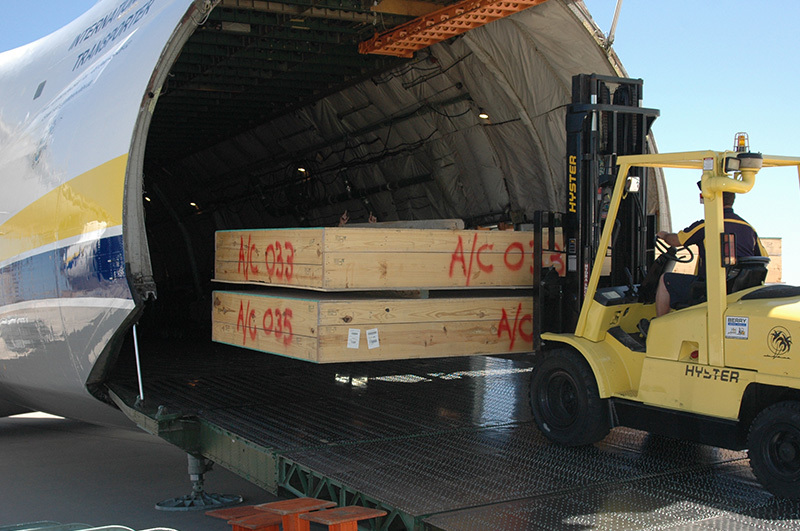 And since AIT is one of the select few CRAF-sponsored forwarders in the United States, the customer knew that the global logistics provider had the credentials to manage the mission. At the outset, AIT began planning the operation by tapping into their vast worldwide network of well-known, highly trusted partners. As a non-asset based carrier, AIT maintains a strong established relationship with the premier provider in the Middle East – a company that instilled a high level of comfort with the customer. As the planning phase unfolded, the trust factor between AIT and the customer deepened. Working diligently with multiple points of contact in the customer’s organization, AIT’s dedicated government team painted a picture that encompassed all of the needs from various sources. Many priorities were identified including: making the move without dismantling the aircraft, devising multiple routing options to account for unpredictable weather patterns and avoiding the need to obtain certain overfly permits. One of the first and most critical pieces when creating the operational script was demonstrating the ability to procure hard-to-find Antonov equipment that could handle the job. Boeing 747s are more easily chartered, but not large enough to accommodate intact single-engine planes. 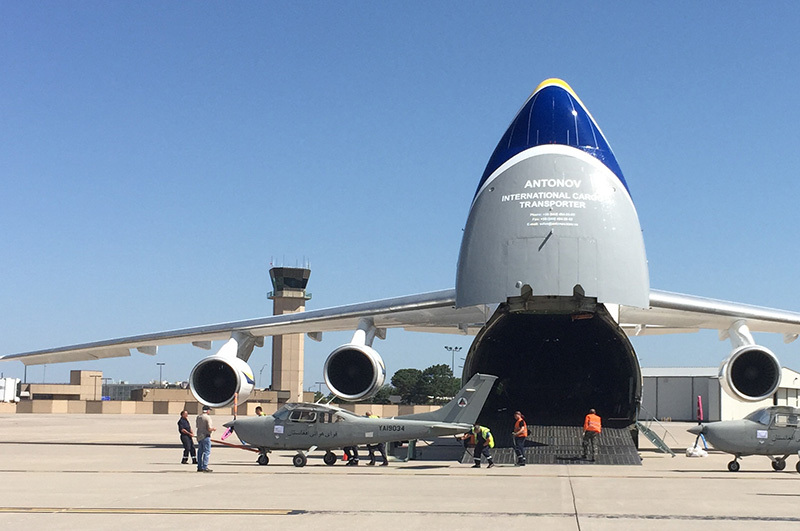 Using an Antonov allowed the aircraft to be transported without the additional cost, risk and complexity of dismantling the equipment. After tapping into AIT’s global aviation network to successfully secure an Antonov for the job, the team turned to the task of routing. A number of routes with varying degrees of political, climatological and security advantages were devised and presented to the customer. This exercise not only provided choices, but also helped AIT determine the customer’s risk tolerance for the range of potential obstacles. After weighing the options, the customer opted for routing that was most secure, but it was costly due to royalties and overfly permit fees that were being imposed by states in the region. The AIT team of experts demonstrated their skills as diplomatic negotiators and worked with local officials to eliminate certain costs. With safe, cost-effective routing in place, the team turned their attention to the finer details of the mission. Every step of the plan was scripted and backed up with secondary and tertiary options. While the customer was aware of the many risks, AIT provided reassurance with a highly regimented communications plan including daily conference calls that confirmed execution every step of the way. Once the mission was underway, everything was running according to plan until the Antonov’s internal crane malfunctioned. While this might have been disastrous for a less-prepared team, AIT immediately implemented one of the mission’s contingency plans and used a tug with a tow bar to load the cargo. The design of the Antonov allowed for its nose to be opened which in turn allowed the tug to exit the front of the aircraft. The remainder of the charter operation was executed flawlessly and the customer’s trust in AIT was rewarded with the successful on-time delivery of the single-engine planes. AIT earned that trust by fielding a dedicated team of experts who employed meticulous planning, harnessing a deep network of contacts to secure the right equipment and personnel, exercising deft diplomatic skills to eliminate costs and fulfilling their commitment to continual, fluid communication. Leverage AIT's white glove solutions for B2C and B2B delivery needs.